So…winter’s here again in my part of the world which normally, for me, means three+ months of hibernation, cozied up inside, snuggled under a blanket, hot chocolate in hand (with marshmallows, of course! ), enjoying the snow and cold through my living room window. Cold outside? Is it? I hadn’t noticed. This year I plan to embrace winter and enjoy its offerings. And I’ve convinced a few friends to do so too. Mwa ha ha! Here is our list of potential activities. We’re not the youngest of bucks either. 50+ is our demographic. 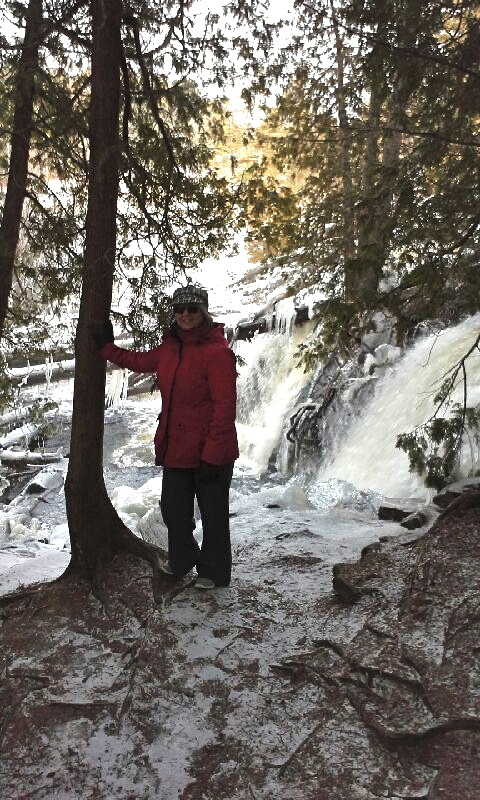 That’s me, hiking by a waterfall. (I admit to missing a few days, but on others I’ve walked up to 3 hours) When did I begin? Mid October – and still doing it! I bought some Nordic Walking Sticks especially for this purpose. When did I begin? Mid-October – and still doing it. Hence, I lost practice too. (That kid is now 22.) And life and age has made me wary of hurting my back. Plus years of less-than-consistant exercise hasn’t helped. But hey! That’s life. If you don’t move it, you lose it. So this year, I’m moving it. Today I got my skates sharpened. That was the easy part. It was public skating time at the rink. Should I go? By myself? Nah, I should wait and go with my friends. But there aren’t many people..why not? ..oh, all right. So I went. Holy cow those blades are thin! How did I ever stand on them? Just trying to walk across the rubberized floor was hard. My ankles were wobbling. My knees felt weak. I felt like a giraffe lumbering along, a giant body on thin legs, knobby knees feeling like they were going to collapse under me with me every step, ankles bending from side to side and all culminating down upon those frickin’ extremely thin blades! Who invented this sport?! What’s wrong with sliding about in your boots? Ok. I can do this. I let an eager kid and his dad go ahead of me through the gates. Let the gazelles go ahead. The giraffe can wait. I was glad to see there were no hyenas on the ice — you know who I mean, those ‘tween boys who like to prey on the weak and work in packs chasing each other around the rink, circling and taunting and coming ever-so-close, trying to make you fall so they can laugh and point. Luckily the plains were calm today. There was one other giraffe on the ice – any hyenas would prey on him first for he, as it turned out, was weaker than I.
I won’t go into every detail but suffice it to say the start was definitely slow and shaky. Tightening my laces helped a bit with the ankle wobble. And where the h*ll are those learn-to-skate-handy-dandy-bars-the-kids-push-around-the-rink-themselves things?! I want one! I gradually gained confidence with each stride. The more I focussed on the fear of falling, the fear of hurting my back, the more difficultly I had. I let go of the fear and breathed into the action. Looking ahead, I took it one push at a time – ‘If I can walk, I can skate’, I told myself. ‘Glide, glide, glide.’ I was doing it! And then I made the mistake of trying to perfect my technique – WAY too soon for that nonsense. I stepped, then… wobble, wobble, twist, bend, wobble – first right, then left, then around, then back, then forth – my arms outstretched waving non-synchronized giant circles in the air. I can’t even imagine what sort of face I was making. I only know that my eyes couldn’t have gotten any bigger. I was trying so fiercely not to fall! And I didn’t!! I stayed erect! Shaken and stirred but with composure regained, I hoped no-one saw the graceful ballet. 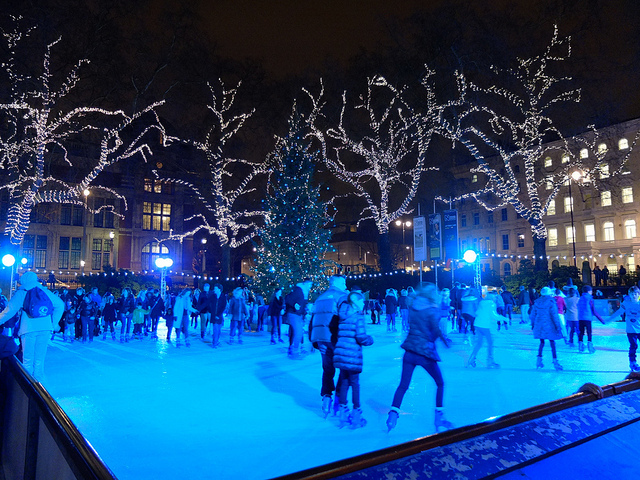 The rink guard skated by and looked politely over, a slight smirk on her teenage face as she adeptly slid past. I laughed imagining the site she had just taken in from behind. Crisis averted, I returned to the basics gaining confidence, calm and speed — yes, I did feel a breeze on my face, even if ever so slight. Shins aching from the strangulation I had inflicted desperate to brace my ankles and make my skate boots one with my feet and from the lack of flex denied by those blades, I decided to call it a day while I was ahead. Total ice time: 15 minutes, approximately. Not bad – one minute for every year absent. I’m definitely going to have to build up to this. So what did I learn by lacing up my skates after 15+ years? We all start as giraffes when we try something new. We lumber and run awkwardly. We wish we ran like gazelles and are fearful of the hyenas who want to trip us up and laugh at us but we’re giraffes, at the moment, so until we learn to be something else, we have to master being a giraffe, and that takes time. When we focus on the fear, we can barely move. The weaker ice-giraffe clutched to the boards and pushed himself half way around the rink by his hands too afraid to take the first step. When he did finally let go, he didn’t fall. He just took his time and did what he was comfortable doing. Don’t be afraid to perfect your technique. Be brave enough to push past your comfort zone. If you’re not ready, then that’s ok. Congratulate yourself for trying and continue where you just were. But you will have to try again so figure out what you need to do to get there. For me, more hours at this level to build my strength and confidence. We learn the most from our mistakes and failures. Would you rather have tried and failed than not tried at all? And besides, how many people are actually watching you anyway? For me, just one (that I’m aware of – excuse me while I check YouTube) and who cares anyway? Everyone starts as a giraffe on skates. Most of the time, WE’RE the only ones that care if we fall. And so what? Get back up! Give yourself your best chance at success. Stay calm, let go of fear, dress for the weather, and sharpen your skates first, then confidently step out on the ice. You can always take a rest on the bench to catch your breath, but don’t give up. Skates blades are really really thin! (I think mine actually shrank.) Gain the balance you need to keep you from falling over. Practice, practice, practice. Embrace your giraffe-ness, especially when you begin something new. Each giraffe step is far greater than any other animal. They can run faster than many horses. Lions rarely bother them since one swift kick in the head and it’s ‘Mary Queen of Scot’s’ for the lion. 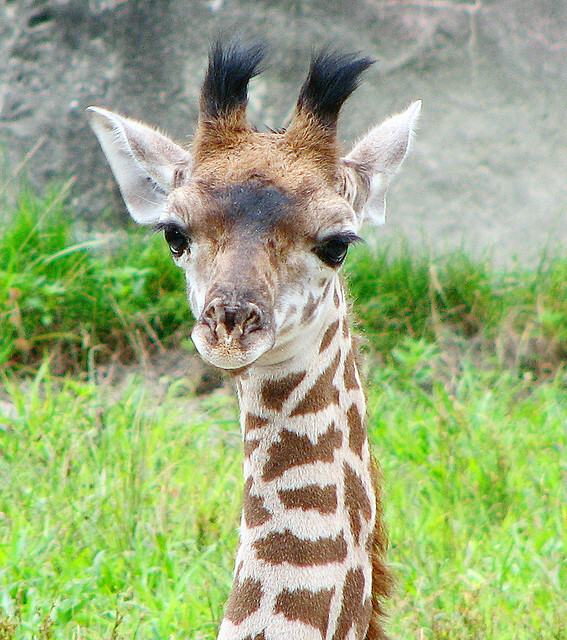 Giraffes are the symbol for intuition and flexibility. That sounds pretty good to me. I’ll try to be the best darn giraffe that I can and if I’m destined to become something else, then I’ll strive to be the best of that too. For now, I am a proud Ice-Giraffe! 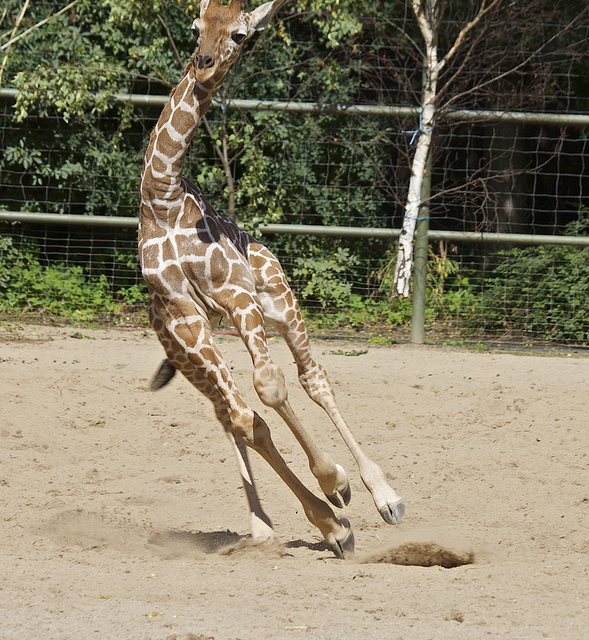 Ever felt like a giraffe on skates in your business or personal life? I’d love to hear about it. Share it below.